More and more lately I find my self buying music on DVDs. I love seeing the bands play live, I love the videos. One of my all time favorite acts live was Frank Zappa. After his death his son Dweezil has taken on a project to keep Frank’s music alive. Zappa plays Zappa is that project. Dweezil has put together a band which sometimes features original members of Frank’s band and they go on the road playing Frank Zappa’s music. Dweezil has said that he had to retrain himself to play the way Frank did, and he nailed it. Some of the former Zpappa band members who appear on the DVD are Napoleon Murphy Brock – vocals, saxophone and flute, Terry Bozzio – drums and vocals and Steve Vai – guitar. Being a huge fan I had to go see it. 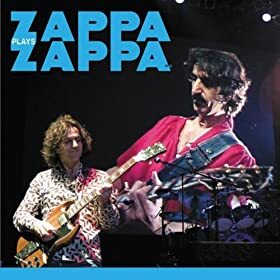 I loved every minute of it and the live show is captured perfectly on the DVD Zappa Plays Zappa. I bought the FanPak that also comes with 3 CDs. The show is filmed the way a concert show be filmed. You see people actually playing instruments. And watching Dweezil’s hand work the guitar is truly watching an artist at work. And the look on his face, you can see that he loves hearing this band play his Dad’s music and doing it so well. It is very clear that this is all about Frank and not Dweezil. And I respect the Hell out of him for that. I also picked up a DVD that explores two of Frank Zappa’s best albums. Overnight Sensation and Apostrophe are examined through interviews with the musicians who played on them, others who have played with Frank and people who know the music. if you are a fan of Zappa at all you will love this. It’s worth the cost just for the tour of the Zappa vaults with all the original tapes and music. AMAZING. If you are not yet a fan, either of this discs is a wonderful place to start. If you are a Zappa fan, you really need to get these DVDs.